Two nights ago I was missing some friends of ours Jaime and Celi, and was remembering some of our pre-kid antics. There were many a night when we would come home from work and cook a meal and have drinks together until the wee hours of the morning. They are both fabulous cooks, Celi for her meat and bean dishes and Jaime for the best roast potatoes I’ve ever had. But this particular memory surrounded Yorkshire puddings. 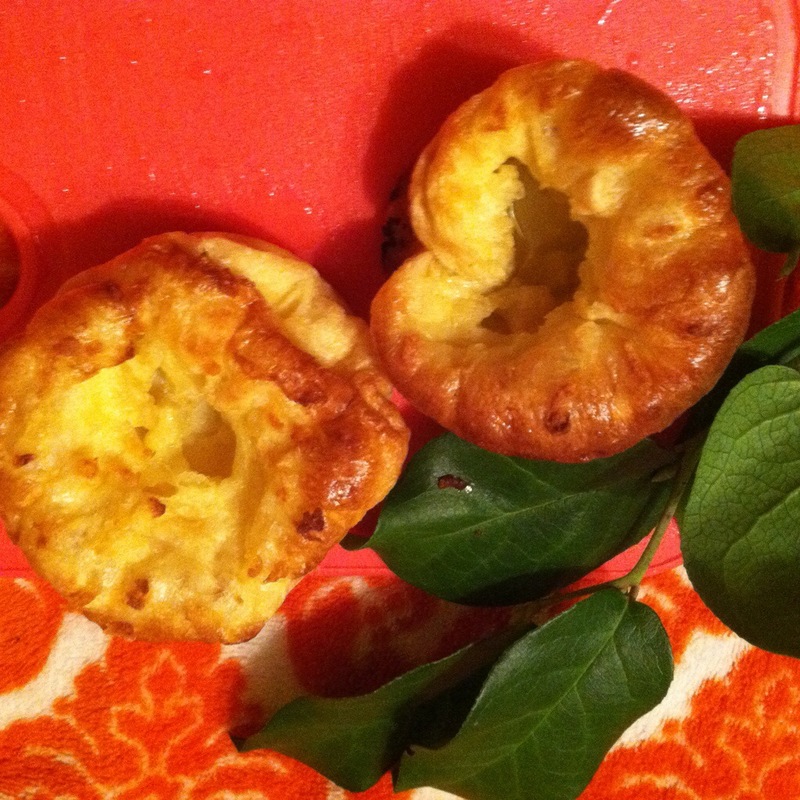 Celi had made a roast and Jaime was regaling us with the simplicity of the Yorkshire pudding. So a couple of nights ago I thought-I think I remember the basics…I’m going to try this. Mine turned out a little eggy-I would reduce to 2 eggs in the future. I’ll give you the recipe I used as it was good, and they puffed up beautifully (although fell quite quickly). Mix milk, flour and eggs well in a medium bowl. Let sit for 15 minutes while your pan is heating. Put a muffin tin with 1 tea oil in each part in the preheated oven for 10-15 minutes ( oil should be HOT). Stir the pudding mixture and add a bit to each compartment, 1/2 to 2/3 full being careful not to spill any. Pop into the oven for 12-15 minutes. Puddings should be a beautiful golden brown and nicely puffed with a hole in the middle. This made 12 easily. Next Next post: Tasha’s Corner: Chia Seeds: The New Coconut Oil?